We are a small family farm located in the heart of the Estancia Valley. 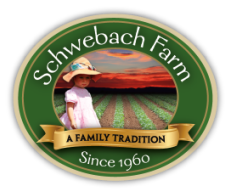 The Dean Schwebach family are sixth generation farmers, and have been farming this land for over 45 years. Together, our family continues the family tradition of farming with gratitude to our Lord for the beautiful land and life that He has entrusted to us, for the gift of being a farm family and the privilege of growing good food for our community. Each year we consider how we can better serve you by growing better produce, and this produce is grown with great care by each member of our family. While we are best known for our sweet corn, pinto and bolita beans, we also grow other pesticide-free, sustainable, non-GMO produce. So come out to the farm and enjoy shopping in our on-site market, relax with some delicious roasted corn on Saturdays, and even schedule farm tours for your group. We look forward to seeing you!